As great as that sounds, we couldn’t help but wonder… Is there more to Langkawi shopping than just scoring a great deal on duty-free beer, liquor, and wine? We did a little research and we’re happy to report that we found several shopping malls and even speciality shops that offer more than cheap booze. To help you make smarter choices when vacationing in Langkawi, here’s a list of best places for Langkawi shopping and what to buy. Kuah is Langkawi’s main town and the port of call for ferries arriving and departing the island. If you’re looking for pristine beaches and crystal clear waters, you’ll want to head up north. And if you’re looking for activities and experiences like zip-line tours, mangrove kayaking, or diving, check out deals on sites like Klook (up to 3.5% cashback) or Travelog (up to 8% upsized cashback). For excellent Langkawi shopping malls and shops selling pretty much anything you could want, then Kuah town’s the place to be. 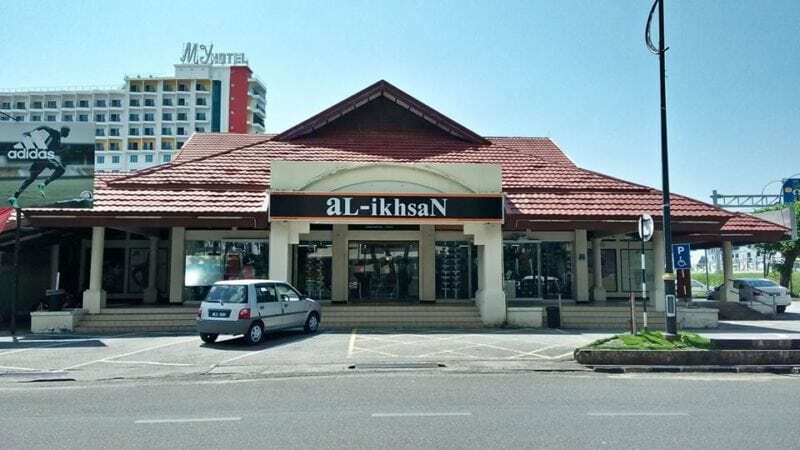 Specialising in sporting apparel and footwear, aL-ikhsaN offers pretty steep discounts on off-season merchandise from big brands like adidas (2% cashback) and Nike (upsized 11% cashback). A good pick-up would be something like the Nike Tanjun, a comfortable lifestyle sneaker (released in 2017), that could be had at aL-ikhsaN for RM139. The exact same pair of sneakers costs USD$65 (RM266) on Nike.com. That’s almost 50% off the recommended retail price! And if your visit coincides with a sales period like the most recent Merdeka Sale, you can enjoy as much as 50% discount off selected items. 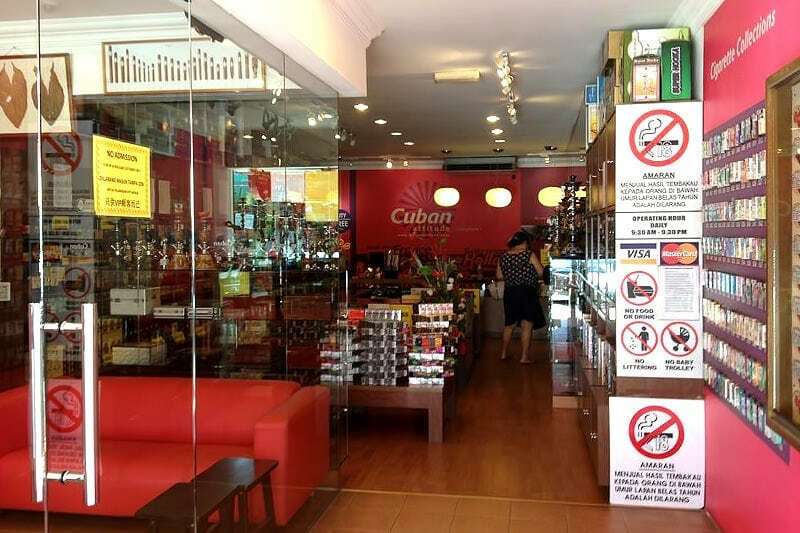 Probably the only specialised cigar store in town, Cuban Attitude’s duty-free prices are a cigar lover’s dream come true. The shop carries cigar brands like Davidoff, Dona Flor, Habanos, and Luis Martinez, but also has a decent selection of cigarettes and tobacco products to choose from. And if you’d like to pick up a gift or a souvenir, you can choose from various smoking-related accessories like ashtrays, cutters, lighters, pipes, and travel cases. If the musty smell of cigars is too overwhelming, pop into Cote de Parfume – just next door – for designer scents at cutthroat prices. 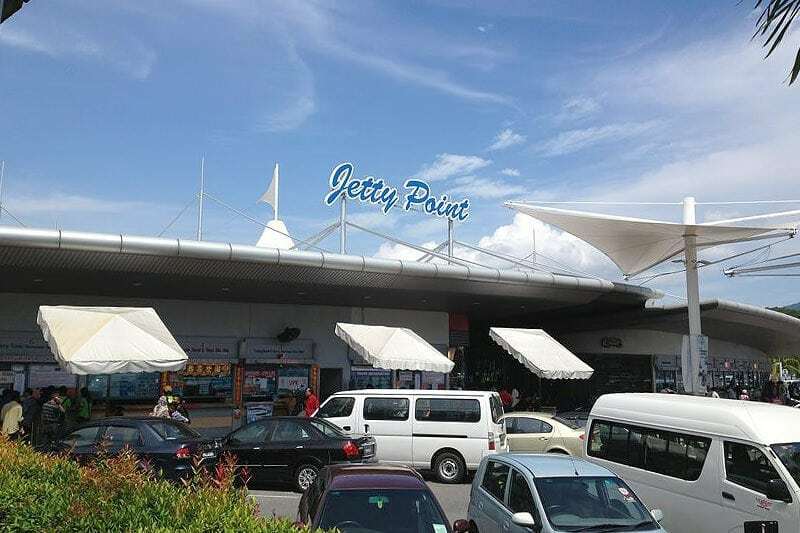 Conveniently located within Langkawi’s main ferry terminal, Jetty Point Complex is a two-storey shopping mall that also houses Langkawi’s largest government operated (read: official) Tourist Information Centre. For first time visitors to Langkawi, you can pick up free maps and brochures at the counter. The top floor of the complex houses a department store which sells everything: accessories, clothing, cosmetics, lingerie, liquor, perfume, and tobacco. The ground floor features shops specialising in cameras, coklat (Malay for “chocolate”), eyewear, jewellery, watches and souvenirs. If you’re hungry after all that shopping, grab a bite at KFC, Kenny Rogers Roasters, or Starbucks. Tired and hungry after visiting Eagle Square? Head on over to Langkawi Fair Shopping Mall, one of the largest malls on the island, for a great selection of factory outlet shops and places to eat. The mall has a motley collection of shops offering clothing, handicrafts, perfumes, and various sundries. If you’re looking for discounted denim and shoes, be sure to check out the Levi’s and Clarks store. Food-wise, there are food courts and restaurants like Secret Recipe and PappaRich. One of the best things about Langkawi Fair is the Billion Duty-Free Supermarket where you can pick up groceries (for your barbecue party), alcoholic drinks, and assorted chocolates for competitive prices. Even the locals shop here, so you know that the deals are legit. The anchor (and majority) tenant of this three-storey shopping mall is Teow Soon Huat Duty-Free & Supermarket. At Langkawi Parade Megamall, you will find one of the widest variety of apparel, chocolates, cosmetics, groceries, liquor, perfumes, sundries, tobacco and wines. Locals often patronise the basement supermarket for its decent selection and reasonable prices too. Notable brands carried by the mall include Body Glove, Converse, Giordano, Guardian, Guess, Hurley, Skinlab, and Vincci. For a cheap date night idea in Langkawi: pick up a couple of boxes of premium chocolates, some drinks from the supermarket, and catch a movie for RM11 at the cineplex. Besides the usual alcohol and chocolates, Langkawi Saga specialises in household items, furniture, decorative ceramics, and crystal. Aspiring home chefs will also be pleased to know that the mall is a great place to pick up reasonably priced kitchenware and cooking utensils from brands like Corelle, Corningware, Tefal, and Zebra. Laugh all you want, but wait till you see Tefal Non-Stick Frying Pans going for half price. Your mom and wallet will thank you for your very thoughtful purchase. The Spa Shop sells various spa supplies like aromatherapy products, calming teas, foot scrubs, hand creams, scented soaps, and massage oils at massively discounted prices. And if you’ve been getting massages and spa treatments around the island, you’ll definitely notice that a number of spa centres use The Spa Shop’s products. It’s easy to see why too as they place a strong emphasis on using natural ingredients sourced from the local farming community, and are advocates of sustainable agricultural practices. Environmentally friendly spa products at mad affordable prices? It’s the perfect souvenir to gift to friends and family. 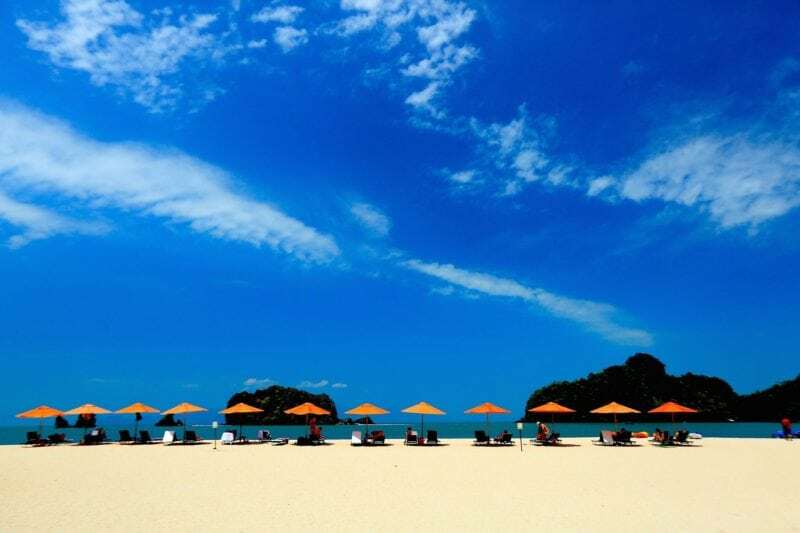 Pantai Cenang is probably the busiest beach town in Langkawi and is where you can find a great mix of cafés, duty-free outlets, seafood restaurants, and souvenir shops. 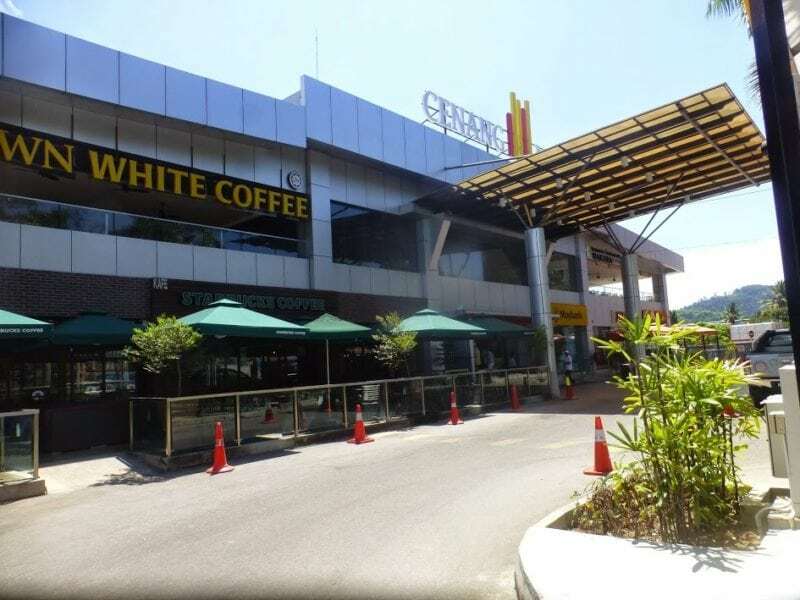 If you need a place to beat the heat – especially during Langkawi’s scorching afternoons – Cenang Mall is a welcomed reprieve along the Jalan Pantai Chenang shopping strip. The mall largely caters to tourists with a Western palate so expect to find restaurants and cafés like Burgersmith, KFC, Manhattan Fish Market, and Starbucks. Besides the standard duty-free selections, the mall also has very well-stocked pharmacies and drugstores. And if you forgot to bring your swimwear (RM49 to 59) when heading to Cenang beach, the mall has plenty of shops to take care of that dilemma. For those in need of more ringgit to fund your shopping spree, Cenang Mall has a few money changers that provide pretty good rates. Need a break from the fishes and penguins at Underwater World Langkawi? 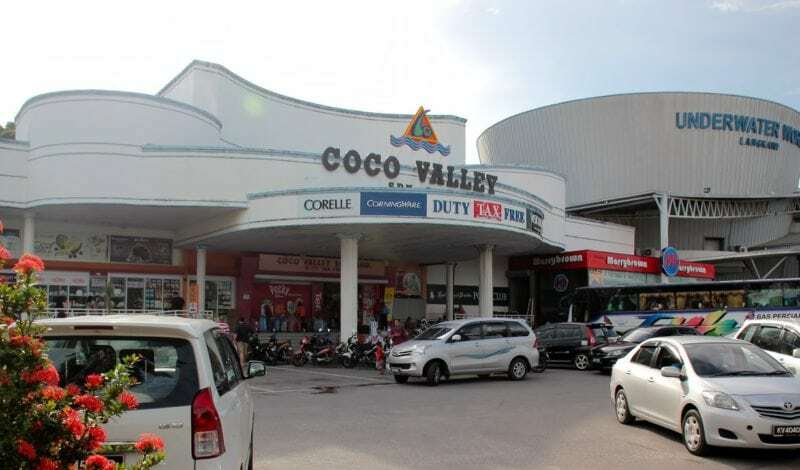 Coco Valley is just next door and is perfect for a spot of duty-free shopping. This mall stocks a decent selection of beers, liquors, and alcohol, but its specialisation is in cocoa products. Chocolate lovers will find most major chocolate brands (think Rittersport, Hershey’s and Toblerone) available for a fraction of the price. Oh, and if you’re concerned about lugging cartons bags of chocolate back to your hotel room, the mall regularly sells luggage bags for rock-bottom prices – a 100L volume spinner bag could be had for under RM100. You’ll find these bags for sale, piled ceiling high at the entrance for your convenience. 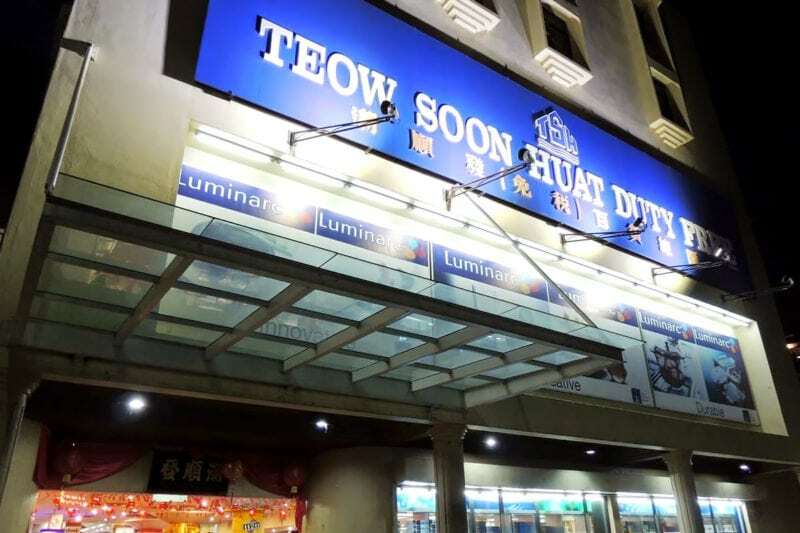 Although technically not a shopping mall, a visit to Temoyong Night Market (only open on Thursdays, from 6 to 10pm) is definitely not to be missed. Not only is it a place to sample authentic and delicious Malaysian food and desserts (a packet of nasi lemak ayam, or coconut rice with chicken, costs RM1), it’s a great place to pick up souvenirs like wood carved statues of the Langkawi Eagle, and handmade kuihs (cakes, cookies, snacks, and sweets) for the family. Need to pick up some last-minute souvenirs before you head to the airport? How about some handmade batik (wax-resist dyed fabric) or songket (hand woven textile)? 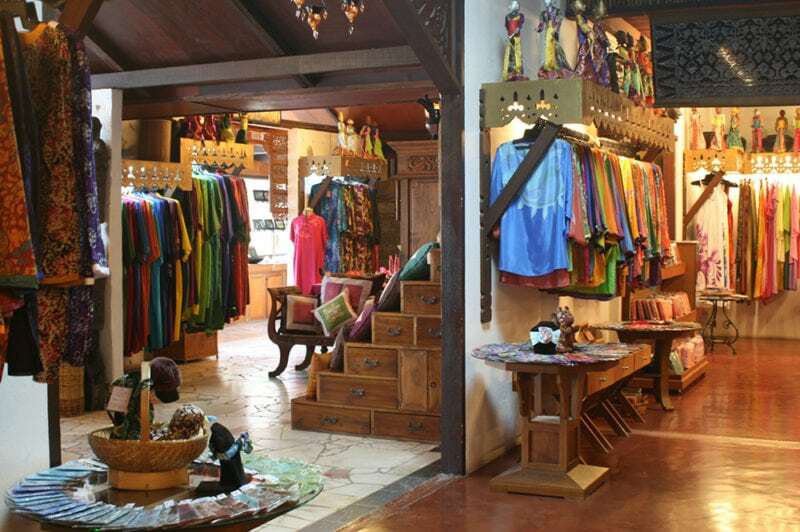 The Atma Alam Batik Village is a batik textile factory that showcases and promotes the art of batik in Langkawi. It is also the place to pick up handmade souvenirs like apparel, cushion covers, handbags, and purses made of cotton or silk printed batik. The centre also hosts art classes where students can spend an afternoon learning how to create their own batik masterpieces. Best of all, this quaint village is a mere 5-minutes drive from the Langkawi International Airport. Not all shops on the island are duty-free, so make sure you check with the staff before purchasing anything. Always check the expiry dates when buying chocolates, especially if they’re heavily discounted or are going for “Buy 2 get 1 free” prices. Merchants tend to use low prices to move products that are nearing their best-by dates. When buying beer, liquor, or wine, ask if you can get a discount if you pay in cash instead of a credit card. Some stores will offer a 10 to 12% discount off the indicated price. Langkawi might be a duty-free island but not all stores will charge the same price for the same product. You will also notice that shops within the ferry terminal and the airport charge slightly more for the added convenience they provide. 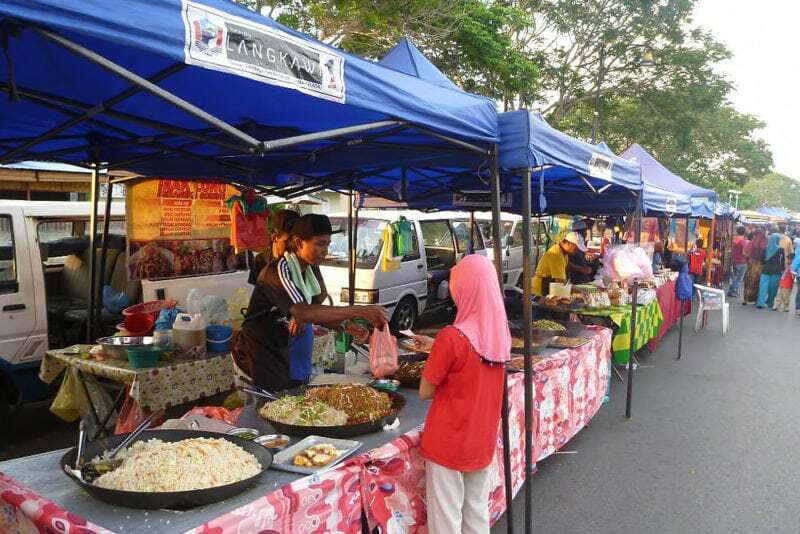 So do all of your Langkawi shopping when you visit Kuah town! Can’t fit all your purchases in the small carry-on you brought with you? You can get a cheap luggage bag from most malls to cart your haul back home.